This year I have posed a question to my students. Where do art ideas come from? 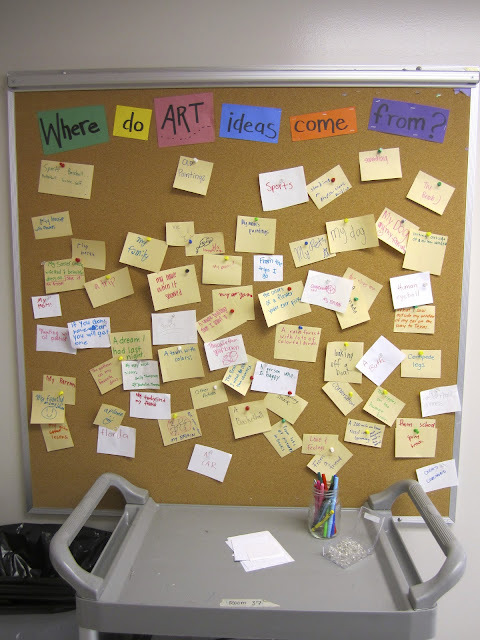 I started a bulletin board where children could write an answer and tack it up for all to see. At first most of the answers were things like "my imagination," "school," "my art teacher".... I started to ask them to be more specific. Are there things in your life, your own unique experience, that would be good ideas for art projects? After they cleaned up their work at the end of class the children began to flock to the board to see how many creative sources they could come up with. It only took a few more specific comments to set the display ablaze with creative thoughts. Now things like "milkshakes," "dinosaur roars," "mermaids," and "the Empire State Building" have found their way into our art room. Hello! I am new to choice-based but loving it so far this year. My students are such happy artists! I found a fabulous children's book called What Do You Do With An Idea? by Kobi Yamada.